Throughout history, humans have relied on water wells as a primary means of accessing potable water. As technology progresses, the design and components of well systems become much more efficient and sustainable. One of the most essential components that make up a modern well system is the pressure tank, which is responsible for several important functions such maintaining system pressure and water pump relief. 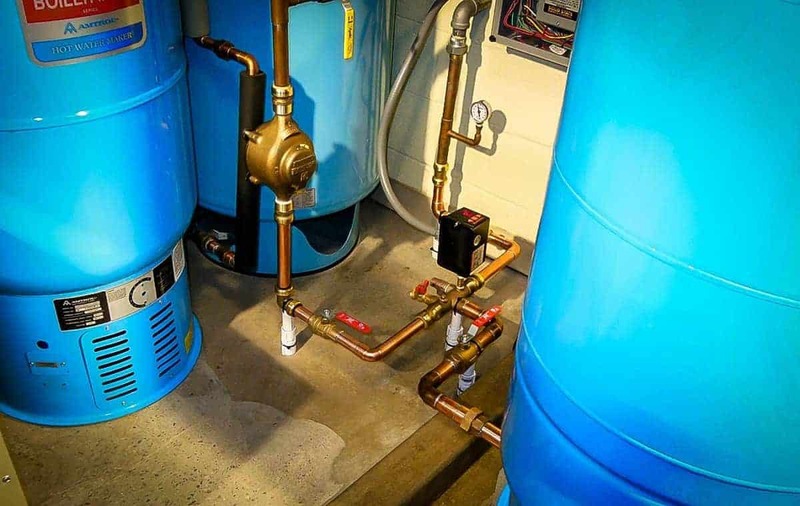 The purpose of this article is to provide well owners with essential information about the well pressure tank as well as where to purchase the most reliable brands. The Well-X-Trol pressure tank by Amtrol is the leader in domestic and commercial pressure tanks and trusted by well owners worldwide. Amtrol pioneered the pre-pressurized design and their dedication to the industry continues to show. Most modern, professionally installed well systems will have a pressure tank as it is an essential part of a properly functioning system. Groundwater which reaches the surface through a well is naturally pressurized. 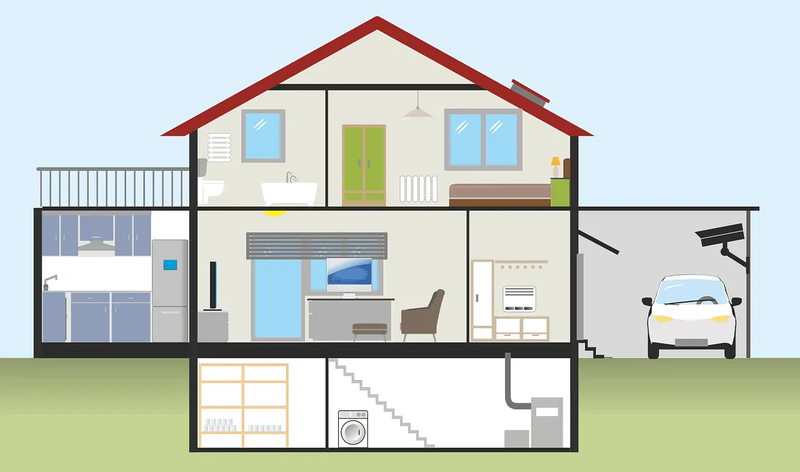 However, the amount of pressure exerted through the system might not necessarily meet the needs of entire household. The pressure tank stores water and keeps it under pressure, and releases it on demand whenever a water fixture in the house is used. Without sufficient pressure, water from the fixtures would trickle out slowly. The pressure tank ensures that the system pressure is within proper range, providing sufficient water pressure throughout the entire household. 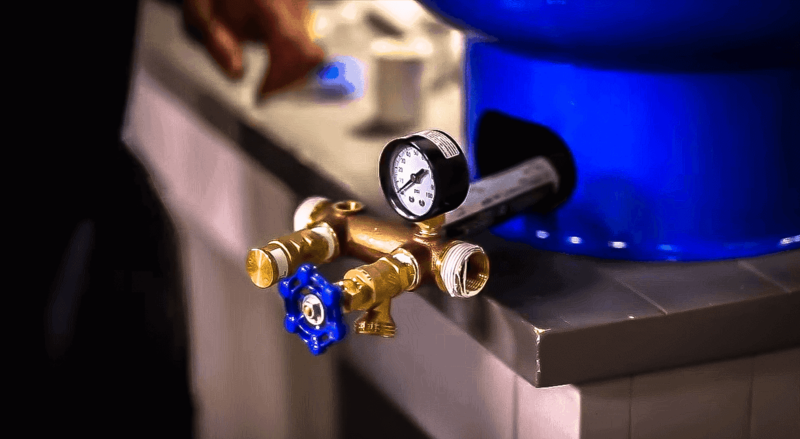 Because the pressure tank is able to store a certain amount of water under pressure which can be accessed on demand, it eliminates the need for continuous water pump usage. With a pressure tank, the water pump will only be turned on when the system pressure drops below the threshold level, and will shut off again once the pressure reaches the threshold. Without a pressure tank, the water pump would turned on every time a sink, shower, or any other water fixture is accessed. This continuous usage would cause unnecessary wear on the water pump and would certainly require more frequent maintenance. With a large pressure tank, water can still be accessed temporarily in the event of a power outage or pump failure. The water reserved in the tank will continue to be used until it is depleted or until power is restored. 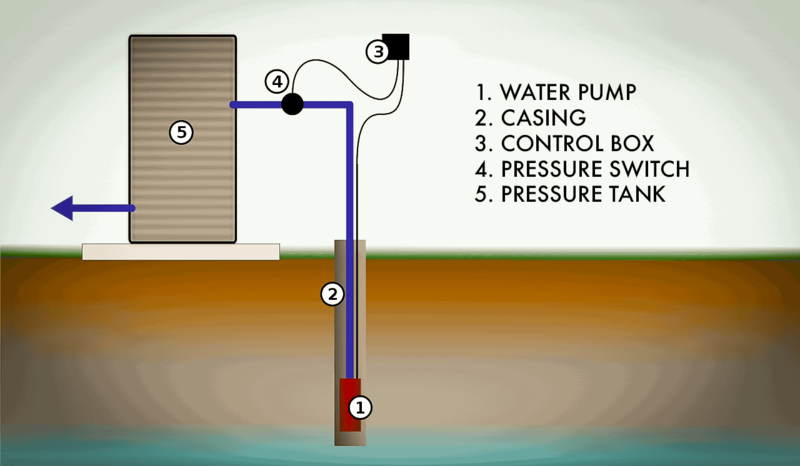 A system without a pressure tank will immediately cease to produce water as soon as the water pump shuts off. With the intermittent use of the water pump due to the pressure tank reserve, electricity is used less often and therefore energy costs are lower. A system without a pressure tank would require consistent water pump usage. The key concept behind any modern well system is pressure. As the water pump forces water upward from the well into the piping system of the home, pressure gradually builds up. The purpose of the tank is to hold, read, regulate, and release pressure as necessary. One Compartment Pressure Tank - Before the invention of bladder and diaphragm pressure tanks, both water and air were stored in one stainless steel casing. Pressure was created by compressed air which would push down on the water. A common problem with this type of tank is that air would gradually dissolve into the water and significantly reduce water pressure, a problem known as "waterlogging". Bladder and Diaphragm Tanks - In order to prevent the waterlogging issue, an invention was made that would separate the water from the air in the tank. Bladder Tanks and Diaphragm Tanks are essentially identical in function and purpose save for a slight difference in design. Diaphragm tanks separate the air and water with a layer of rubber which rises and falls according to the pressure in the tank. 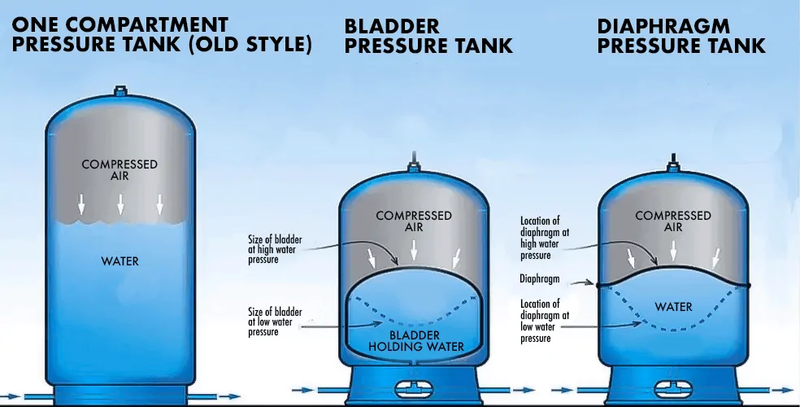 Bladder tanks hold the entire volume of water in an enclosed rubber bladder which enlarges and contracts according to the pressure in the tank. Both types of tanks are designed to separate the water from the air in order to prevent waterlogging. The following will explain how a bladder/diaphragm tank works in a well water system. For this scenario, a pressure range of 40-60 psi will be used. Starting with a full tank, the pressure gauge should read somewhere between 40-60 PSI. The water pump is off and the system is stable and idle. As soon as a water fixture in the home is used –the kitchen sink, for example– the compressed air in the tank will push against the bladder/diaphragm, forcing water out of the tank, through the plumbing system, and out of the faucet. Water will continue to be drained from the tank until either water usage has ceased or until the water pump turns on. As water continues to drain from the tank, the pressure will drop. When the pressure drops below the threshold of 40 PSI (also known as pump "cut-in" pressure), the pressure switch will signal the water pump to turn on. With the water pump turned on, water is being pumped from the well and into the system, gradually filling up the water tank once again. As the tank fills with water, the bladder/diaphragm expands, creating more air pressure inside the tank. Once the pressure in the tank meets the 60 PSI threshold (pump "cut-out" pressure), the pressure switch will signal the water pump to stop pumping, ceasing the influx of water into the tank. With the water pump off, the pressure in the tank will remain at 60PSI until more water in the house is used, draining the tank once again. Once the pressure drops to 40 PSI, the pressure switch will signal the pump to turn on once again, starting the cycle over. Air Valve - Pressure tanks will have an air valve used to release pressure and to perform maintenance testing. Typically, a pressure gauge will be attached to the air valve in order to read the air pressure from within. Drawdown Capacity - Because of the requirement for air pressure from within, the tank is never fully occupied with water. Thus, the amount of available water will always be less than the actual size of the tank in terms of gallons. The maximum amount of water a tank is actually able to provide is known as drawdown. Drawdown is dependent on a number of factors including the size of the tank, the household demand for water, and the size of the pump. 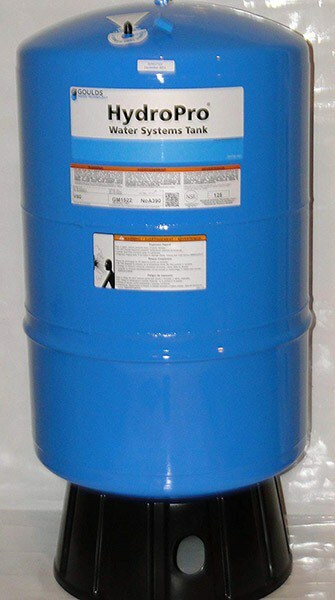 Material - Most pressure tanks on the market are made of a high-strength steel shell with a polypropylene inner-lining. The lining is to ensure that the water is protected from making contact with the steel, which can corrode and damage the tank. While steel tanks continue to dominate the market, carbon-fiber tanks are being introduced, which claim to have greater drawdown capacity. Diaphragm/Bladder - Modern residential well systems should use tanks which use a diaphragm or bladder in order to reduce waterlogging. Diaphragm/Bladder material is usually made of durable, non-corrosive rubber. 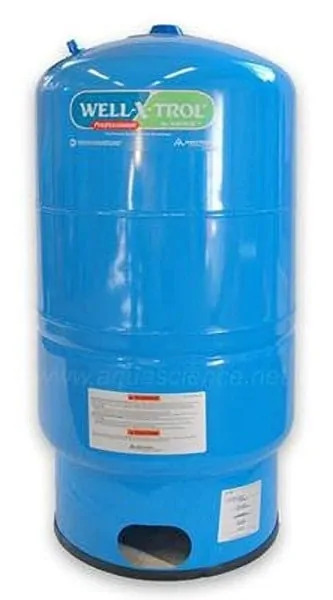 A pressure tank which uses a diaphragm or bladder will usually come "pre-charged", which means the air inside the tank is factory sealed and pressurized for use. Choosing the right size for a pressure tank is critical as it can greatly affect the life of the pump. A tank which is too small for the water demand may result in pump overuse. As a general rule, it's usually safer to err on the side of a larger tank. While the logic behind sizing a pressure tank is fairly straightforward and can be done with a few general rules of thumb, it is best practice to consult with the pump and tank manufacturers for specifications. The volume of water which the tank will hold will always be less than the actual size of the tank. This is referred to as the tank's drawdown capacity. In the process of sizing the tank, the drawdown capacity is the number that is sought after. With the necessary drawdown capacity determined, the actual tank size can then be decided. Flow Rate - The drawdown capacity is dependent on a variety of factors, but perhaps most importantly is the pump's flow rate. At this point, the water pump has already been selected based on the household's demand for water and the well capacity. The water pump's flow rate in GPM will be needed to determine the tank's required drawdown capacity. For flow rates between 0 and 10 GPM, multiply by 1. For flow rates larger than 20 GPM, multiply by 2. Based on the above equations, a pump with a flow rate of 16 GPM would need a tank with a 24 gallon drawdown capacity (16 x 1.5 = 24). With the required drawdown capacity determined, the proper tank size can be decided by consulting the manufacturers sizing chart. Most tank manufacturers will have a chart which lists the various tank models alongside their respective drawdown capacities. One thing to note is that there will be separate columns for each pressure setting. For example, a system running on 40/60 pressure setting will only need to reference that portion of the chart, as a 40/60 setting will have a different drawdown capacity than a 50/70 setting. By referencing the required drawdown capacity within the correct pressure setting column, the exact tank model and size can be decided. 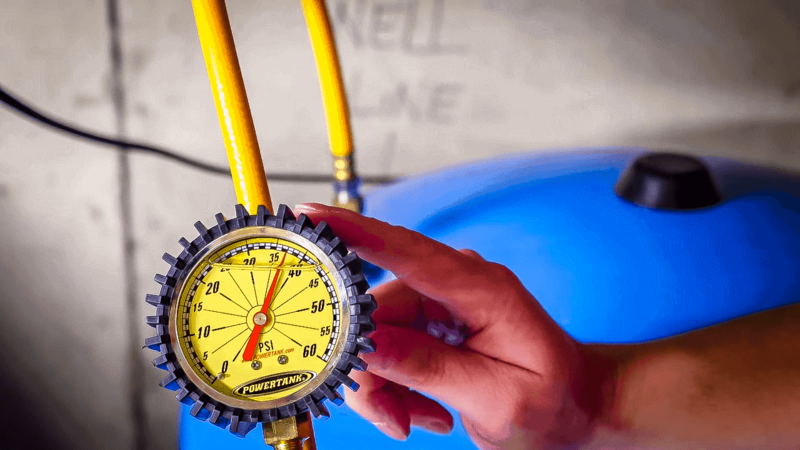 It is important to often check your well pressure tank to ensure that it is functioning properly. You can follow these steps to troubleshoot your tank if you encounter these issues. When this happens, you can ask your plumber to try to repair it or replace the entire water tank bladder. Turn off the pump and drain the water pressure from the system, then check whether the water pressure tank id abnormally heavy. When this happens, you can consult a plumber to investigate and repair the leakage. For bladder tanks, drain the water pressure by turning off the power and opening the drain faucet of the tank. Check the pressure using a tire gauge once the water has been drained and adjust to approximately 30 psi if possible, then re-activate the system and flush until the water is clear. What are the Best Well Pressure Tank Brands? Because the pressure tank is a core component of the entire well system, responsible for regulating pressure and for easing the workload of the well pump, the importance of selecting a the right well pressure tank cannot be overemphasized. Selecting a poorly-made pressure tank may result in more troubleshooting scenarios than necessary. Worse yet, a faulty pressure tank can potentially damage the entire system. In the following section, we've complied the most trusted, best-reviewed, professional pressure tank manufacturers used by private well-owners and businesses. 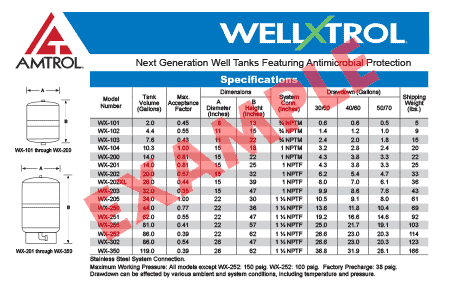 The Well-X-Trol series by Amtrol is the gold standard in well pressure tanks for private well systems. Amtrol invented the pre-pressurized tank design over 50 years ago as a better solution to the air-over tank. By incorporating the diaphragm in the tank itself, the problem of waterlogging has essentially been eliminated. Several other manufacturers have followed suit in including the pre-pressurized system in their tank design, but Amtrol is certainly the first. Amtrol remains the industry standard in well pressure tanks today. Well-X-Trol tanks are lined with an anti-microbial liner which neutralizes bacteria on contact. Backed by a 7-year warranty, the Well-X-Trol tank guarantees quality design and time-tested efficiency. The 20-Gallon pressure tank by Water Worker features a heavy duty, butyl rubber diaphragm pre-charged at 38 PSI. The outer shell is made of rugged steel while the inside is lined with polypropylene to prevent corrosion. 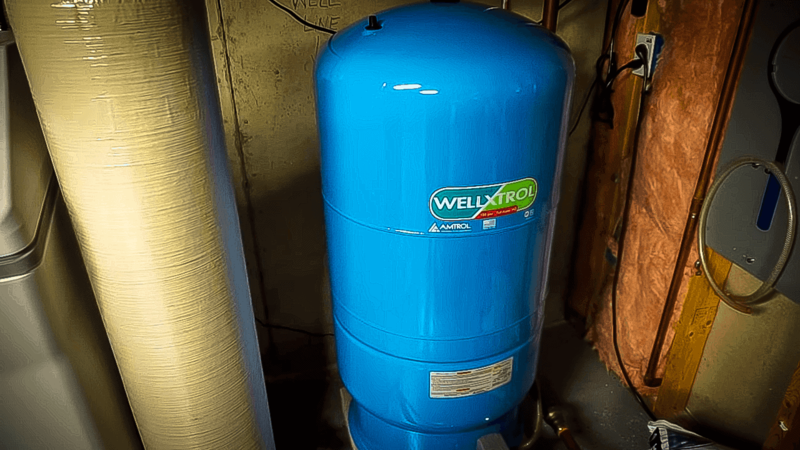 Owners of the Water Worker pressure tank report that it rivals the quality of the popular Well-X-Trol tank minus the price tag. 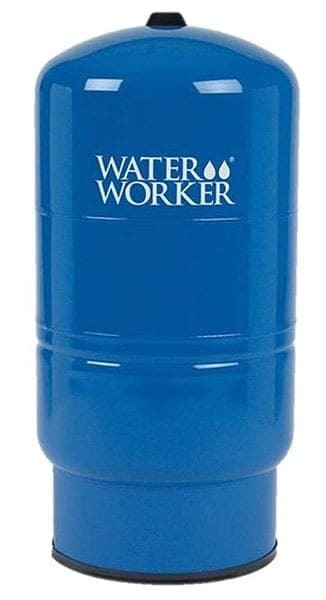 With a 5-year warranty, the Water Worker tank is an excellent balance of quality and value. The Wellmate pressure tank by Pentair features a fiberglass shell rather than the traditional steel casing. Fiberglass is impervious to rust making these tanks ideal for coastal regions. It also creates a greater drawdown capacity and is much lighter in weight as compared to their steel counterparts. The interior cell is constructed of heavy-gauge polymer and lined with high-density polyethylene. The base is made of sturdy polymer, making it durable and impact-resistant. 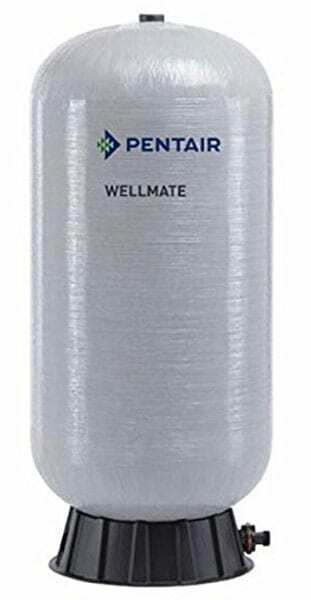 For those in environments where corrosion and rust is a concern, the Wellmate fiberglass pressure tank by Pentair may be the perfect solution. The Flotec 35-Gallon steel tank by Pentair is a compact pressure tank designed to accommodate a small home. Pre-charged with 40 PSI of nitrogen, this tank is ready for quick and easy installation. 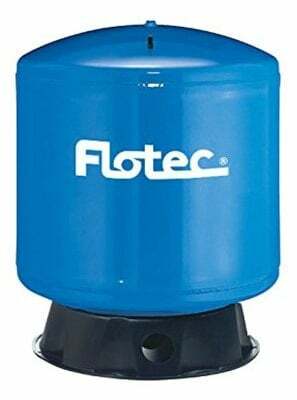 With a replaceable bladder, the Flotec tank is a worthwhile investment with little maintenance cost. The HydroPro tank by Goulds is a well designed tank with great customer support. Owners of the HydroPro report quality design and satisfactory customer service. Features a 5 year warranty. If the pump is considered the heart of the well system, the pressure tank might be considered the lung. By regulating the air pressure through the expansion and contraction of the diaphragm, the pressure tank is responsible for keeping the pressure of the entire system within functional range. Without a pressure tank, the well pump would certainly be overworked and may malfunction prematurely. Selecting the right brand and size of pressure tank for a well system is one of the crucial decisions and well owner needs to make. Thank you for taking the time to read our article on the best well pressure tanks. We'd love to hear your feedback in the comments section below. If you've found this article to be useful and are interested in learning more, be sure to sign up for our newsletter.